Colors of emerald green, red, golden yellow, black, and more in a repeating rows print of diamonds and arrows ethnic style print on a cream color super soft Ponte De Roma knit. Ponte de Roma fabric is a thicker medium weight and has a nice stretch, excellent drape, and great recovery. Fabric has a subtle horizontal texture. 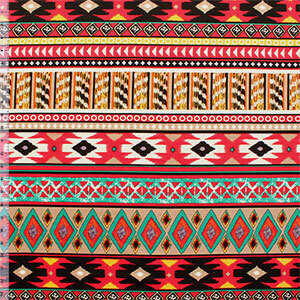 Amazing designer fabric great for maxi skirts, dresses, tops, and more! Design repeat is 23".